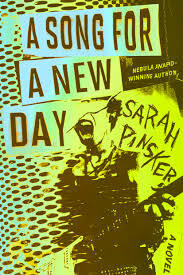 Sarah Pinsker was kind enough to drop by today to talk about her debut collection Sooner or Later Everything Falls into the Sea, and her debut novel, A Song for a New Day. To kick things off, I will shamelessly steal from Sarah’s author bio in order to make introductions. 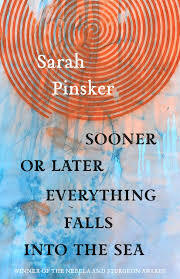 Sarah Pinsker is the author of the novelette “Our Lady of the Open Road,” winner of the Nebula Award in 2016. Her novelette “In Joy, Knowing the Abyss Behind,” was the Sturgeon Award winner in 2014 and a Nebula finalist for 2013. Her fiction has been published in magazines including Asimov’s, Strange Horizons, Fantasy & Science Fiction, Lightspeed, Daily Science Fiction, Fireside, and Uncanny and in anthologies including Long Hidden, Fierce Family, Accessing the Future, and numerous year’s bests. Her stories have been translated into Chinese, Spanish, French, and Italian, among other languages. Welcome, Sarah, and congratulations on not only your debut collection, but your debut novel coming out this year! Could you give folks a taste of the sorts of stories they’ll find in your collection, and without giving too much away, a hint of what your novel is about? Hello! For the collection, we tried to choose a mix. I have about fifty published stories, and it was definitely hard narrowing it down. In the end we went with a mix of stories that had gotten some attention and stories that I liked but maybe not as many people had seen. As for content, I really liked this blurb from the publisher: “The journey is the thing as Pinsker weaves music, memory, technology, history, mystery, love, loss, and even multiple selves on generation ships and cruise ships, on highways and high seas, in murder houses and treehouses. They feature runaways, fiddle-playing astronauts, and retired time travelers; they are weird, wired, hopeful, haunting, and deeply human.” That’s as good a summation as any. Both the collection and the novel sound amazing, and I can’t wait to read them! I’ve been a fan of your work since “In Joy, Knowing the Abyss Behind”, and you’ve written so many fantastic stories over the years. One of my recent favorites is “I Frequently Hear Music in the Very Heart of Noise“, published last year at Uncanny. It feels more experimental than many of your other pieces in terms of structure and a less traditional narrative. Could you talk a bit about how the story came together, and what inspired it? I love that story. I needed a story to bring to the Sycamore Hill workshop, and I had absolutely nothing. I found myself in a lovely library, and I decided to start pulling non-fiction off the shelves until I figured out my story. I happened upon a book called The Streets Where They Lived – A Walking Guide to the Residences of Famous New Yorkers, which is a book of walking tours. As I paged through it, it occurred to me that these walking tours were a form of time travel. A tour of a single block in midtown would bring you James Dean and Dorothy Parker, or a single building might offer you a glimpse into the lives of both Sylvia Plath and Phylicia Rashad, decades apart. They didn’t differentiate. And this story came to me that was a layering of people and stories and song, and the fantasy of a character invoked into the midst of all the real details, and weird comings-together of details that I hadn’t expected to connect, and also a love letter to the energy of New York. I grew up in the city, and I don’t think I’ll ever live there again, but there’s a feeling I get when I’m there that is unlike anyplace else I’ve been. Music is a big part of your life, and as you mentioned, a recurring theme in many of your stories. I’m curious – do you listen to music as you write, and/or do any of your stories have a mental soundtrack that you put together either while writing or after the fact? Have you ever written an original song based on one of your stories or vice versa? I don’t listen to songs as I write! Music takes up too much of my attention. I can sometimes put on something instrumental and let it fade, but for the most part I prefer silence. Or, oddly, coffeeshop noise, which can include conversations, cappuccino machines, and their music, so long as it isn’t my music. That said, many of my stories do have mental soundtracks. I don’t usually get around to actually making a playlist, though sometimes there’s a song I’ll need to hear before or after I write, or a series of songs. I’ve definitely written parts of a lot of the songs that show up in my stories, but my plan is to keep those to myself. I want people to imagine for themselves what the songs and the bands sounds like. I don’t think I’ve ever done the reverse, if the reverse is writing a story based on one of my songs; usually a song is complete and stands alone. I guess I’ve written stories based on other people’s songs, but that feels like a different beast. That’s usually because they’ve allowed some vagueness for me to explore that isn’t there for me in my own songs, since I know what lies between the lines. Sticking with music, how does assembling a collection compare to assembling an album? Is there any crossover in terms of the way you think about rhythm and the way one piece flows into, compliments, or contrasts with the next, or in terms of building an overarching theme? Yes, absolutely! I don’t know if other people do this, but I ended up writing the first and last lines onto recipe cards, so that I could try an order, check the flow, then rearrange again. With albums, it’s similar: a lot of listening to beginnings and endings, checking keys and rhythms and modes and instrumentation. You want a strange balance of things that feel good next to each other but don’t sound similar. And then there’s a lot of reminding myself that whatever I choose is right in the end, since nobody else will ever know what the other options might have been. One last question related to music, but also touching on another of your passions, horses and riding – what are some of the tropes around music and horses that fiction/film always seem to get wrong? Conversely, who really gets those things right? Ha! I could write a book about this. I’ve led several workshops and conference panels on the subject. An author usually has one chance to win my trust on horse stuff, and if they blow it by having the hero gallop off on a twenty-hand stallion, I’m hard to get back. In film or TV, I usually can’t stand how much the horses talk. They’re constantly whinnying. Horses are pretty quiet unless they’re greeting you because you’ve brought their dinner, or you’re riding away on their best friend and leaving them behind. In books, it tends to be the horse-as-motorcycle scenario, where a horse is a convenient, uncomplaining, form of travel, and for some reason often has to be majestic and huge. The larger your horse the more food you’re going to need to pack for them – and the harder it’ll be for you to hop on and off without a fence or mounting block handy. Horses have likes and dislikes. They go lame. I should probably stop there. Who gets it right? Molly Gloss is a horsewoman, and it shows in her books. Judith Tarr, also. Le Guin doesn’t write a ton about horses, but the first lines of “The Ones Who Walk Away From Omelas,” with “They flared their nostrils and pranced and boasted to one another; they were vastly excited, the horse being the only animal who has adopted our ceremonies as his own” captures horse spirit really well, even as it ascribes human emotions. You lived in several places, but currently call Baltimore home. What are your favorite things about the city? What are the spots you like to bring guests, or recommend to people visiting for the first time? Are there any particularly fantastical or weird spots in the city that have inspired any of your fiction? This is another question that I could get carried away with if I let myself. I usually take visitors to the George Peabody Library, which is an absolutely stunning reading room, and sometimes to the Owl Bar, where during Prohibition they used the lit-up eyes of the owl sculptures to tell patrons when a raid was imminent. The American Visionary Art Museum is probably my favorite museum anywhere, for both the weird art and the excellent curatorial notes. If a person were to visit on the first weekend of May, I would get to take them to the AVAM’s kinetic sculpture race, where human-powered sculptures shaped like giant poodles or elephants or the monsters under your bed try to make it through a miles-long course of streets, waterways, mud, and sand. The fantastical or weird spots that have shown up in my own fiction tend to be on a smaller scale. I have a story that was inspired by the locked room in the attic of our first rental home. The original story in the collection mentions the way the circus used to walk their animals to the arena from the trainyards in West Baltimore, allowing kids a moment of wonder regardless of whether they could afford tickets. Other than asking about their cities, one of my favorite questions to ask authors is about non-writing related jobs. What is the most unusual job you’ve ever had? What did you learn from it, and has any aspect of that job worked its way into any of your stories? I’m trying to think if any of my jobs have been that unusual. I’ve run Girl Scout camp riding programs, led trail rides, tutored SATs, played music. I don’t think the tutoring has made it into a story yet, but all three of the other things have. Writing and performing music has definitely taught me a lot about the kind of writer I want to be, and the kind of person I want to be. I’m glad I exorcised some of my cockiness on that career, so I could come into this one without expecting to be owed anything. With your collection out, and your novel on the horizon, what else are you working on, or have coming up that you want folks to know about? Um, let’s see. I’m working on another novel, and I have a whole bunch of stories in the hopper waiting to be written, and I have a story that I really like in the anthology If This Goes On, which was just released by Parvus Press. I haven’t gotten my copy yet so I haven’t read the other stories, but it’s edited by Cat Rambo and has a stellar lineup: Nisi Shawl, Andy Duncan, E. Lily Yu, Steven Barnes, Zandra Renwick. I’m proud to be part of that one. Ooh. I’ll have to check that out! Thanks for stopping by!